Stadia works, but I still have far more questions than answers. If any company is in a position to deliver a game streaming service, it's Google, but my experience with Stadia at GDC left me with a lot of questions, especially because of the strange way it was demoed. In a word, it was fine, but at this point I'm not convinced that the latency will be acceptable for fast-paced games, at least for anyone who's used to playing on PC already. Only a few games were being demoed with Stadia, including Assassin's Creed Odyssey and Doom (the 2016 iteration, not Doom Eternal). I gave both a whirl, but I was most interested in Doom, given that it was more likely to highlight problems with input latency. The graphics in both games looked good, though I can't say whether they're equivalent to the PC versions' nightmare and ultra presets, or if they're turned down a few notches. I suspect the latter, especially with Assassin's Creed Odyssey which is a beast to run (and it was still a bit choppy at times on Stadia). Whatever the settings, the graphics didn't raise any concerns, and I'm not especially worried about fractionally better shadows at the cost of smoothness. So how does Stadia fare? Both games are playable, and if that's all you're after, Stadia will suffice. But latency is clearly present. During an intense fight in Doom, moving and aiming and shooting with the mouse and keyboard just feels sluggish, especially compared to playing on a high-end PC. Playing the first level of Doom, for example—the training level—I died five times. Five! I never die on the first level these days when playing at home, at least on the default difficulty. The problem is that the latency, or simulated latency in this case (more on that in a second), caused me to repeatedly aim past possessed engineers, soldiers, and imps. Aim, click, boom! I missed. Then I'd overcorrect. Click-boom-miss again. That's a great way to waste shotgun ammo. After a few minutes playing it's less of an issue, but despite smooth-looking framerates, it never feels quite as responsive as I'd like. Watch someone else play and Stadia looks quite good, but in person the delayed input to screen loop is very noticeable. What can this tell us about the actual Stadia experience? Unfortunately, we don't know. It's not clear exactly what the games are actually running on right now. The test systems are apparently using dev kits, running in the cloud but with the option to simulate different network conditions. These are running settings basically equivalent to last year's Project Stream—1080p 60 fps and 20Mbps—and Google wouldn't confirm whether this is the same hardware as the on-stage demo or something else. That simulation of network latency is where things get really troublesome. In the screenshot further up this page, you can see (if you view the fullsize image), the stream quality, RTT, and "Frames [Janky]: 5." I think that last bit means 83ms of extra latency being injected to approximate the experience of running Stadia from the cloud during less than ideal conditions. What's it like under ideal conditions? "We're not showing that right now. We only showed that earlier in the week." Yeah, that seems like a weird decision to me as well. 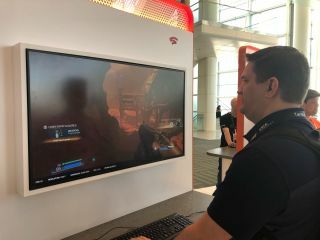 Doom on a Windows PC running at 60 fps will be in the 50-70ms latency range, but the Stadia version feels closer to 200ms. If you're used to playing games on an HDTV using a console, maybe you won't notice—the scalers in many TVs can easily add several frames of latency—but I absolutely did. It's why I kept dying, though I did get better over time. Playing Assassin's Creed Odyssey with a controller, the latency issue wasn't as apparent, but then Odyssey isn't as fast-paced as Doom, a lot of Odyssey's animations cover up any perceptible latency, and a controller doesn't feel as precise as a mouse regardless. Assuming the current demo is similar to the way Stadia will launch, does that really matter? For the target audience, I don't think so. People who want to play games will be able to do so. But even if that most vital part works, I have a lot of other questions about Stadia, and Google isn't really giving any answers just yet. The biggest question is easy: how are we paying for this? How much will Stadia cost? Google can take any one (or multiple) of several options with Stadia pricing, each with potential benefits and drawbacks. Will Stadia have an hourly rate, a monthly subscription price, or something else? We don't know yet. How will we buy games, and what games will be available? We don't know that either. Until Google provides a price and other details, there's not much more to say. The back-end Stadia hardware looks reasonable (roughly equaling a 6-core or maybe 8-core Intel CPU and an RX Vega 56 GPU), about what you'd get from a midrange PC costing $750 these days. Priced too high, or without enough games, or with any number of other problems, and Stadia might end up in the same boat as Google+. While we could see bandwidth information in the Doom demo (20Mbps for 1080p60), that's apparently not what we should expect on the final hardware. Google says Stadia can scale up and down to various bitrates, and while I doubt 4K 60 fps will run well on a 20Mbps connection, it should be OK on faster connections. Meanwhile, 720p60 could cut the bandwidth requirements down to 5-10Mbps. One thing Google did state is that it's planning on 60 fps streams at all resolutions at launch, with the potential for 120 fps streams in the future. Google intends to launch Stadia this year for the US, Canada, UK, and much of Europe. It looks like the platform is mostly in place, at least for those with decent Internet connections, and Google is working with developers to bring more games to the service. Once Google announces games and a pricing model, all it needs is hardware in its datacenters at various locations around the globe. Determining how many servers to put in each datacenter is no trivial task, but Google likes to emphasize its expertise in such things and seems confident it will work. After playing a couple of games on Stadia at GDC, I do think the service has potential. It will never beat the performance of local hardware (network latency will always be a lot more than the latency between your local peripherals), but over time, it could easily surpass the 'good enough' level for many. It sort of doesn't matter. Google can succeed where so many other attempts have failed, but even if it doesn't, some other streaming service will fill the gap. Whether it's Google, Apple, Nvidia, Sony, Walmart, or some other company, game streaming services feel inevitable. They might not be for everyone, at least initially, but there's a reason so many companies keep trying to make it work.